It raises a lot of questions, no doubt designed to hook the player’s interest. Like, why is the “Artificial Life System” so evil, since that otherwise sounds pretty cool? Or, why does the federal government have only two Special Service agents? And most importantly, what is this new type of time bomb? Or even, what is a time bomb? The manual actually explains things a bit better. There we learn the antagonist is Mr. K, “a genius scientist gone mad”, though I guess he was just a grad student or something since he’s only Mr. K. He’s evidently a competent roboticist though, and he creates some “war-like bodies”, which is never something you want to hear. Then, he uses them to take “control of the United Nations future industrial city, Atlantis” and, whoa whoa, talk about burying the lede, game. Future industrial city, Atlantis!? And it belongs to the United Nations! I would play a game just about that! Well anyway, Mr. K took it over, and is going to use it as an evil base. I guess this is why we can’t have nice things, world. So, enter the special agents. The game only identifies them as “Ben and Andy” which are among the least threatening names for a heroic duo. The arcade version of the game gives their full names though: Ben Breaker and Andy Attacker. I could sort of see “Breaker” as a lastname, like maybe it got changed at Ellis island. In fact, a brief googling shows there are in fact people named “Ben Breaker” in the world, which is pretty amazing and makes me wonder if they know about this game. But poor Andy- imagine how hard it must’ve been growing up with the lastname ‘Attacker’. So the special service agents Ben and Andy are to go into the industrial island Atlantis, and strategically place the “time bombs” around to completely annihilate the place. You might think that’s pretty brutal, destroying an entire city and all, but don’t worry! Robots aren’t people. The manual assures us that “all the enemies they encounter on the way are artificial, non-living bodies”, so it’s okay to kill them. Mr. K is a person of course, but I guess the United Nations authorized us to assassinate him instead of putting him on trial at the Hague. So Ben and Andy make their way through Atlantis, placing time bombs, killing warlike artificial non-living bodies by the dozen, until they get to Mr K’s lair. There, he was building a giant goat-headed robot that the manual hints would have been invincible. We’ll never know though, because we destroy it with time bombs. The end, Ben and Andy out. That’s a picture of Mr. K surveilling Ben and Andy, and turning to laugh at the audience. Mr. K, you fourth-wall breaking rascal! We have a play area, a map, a list of enemies, ammo counters, score, a timer… it’s a lot to take in, and since you die in one hit, the game is a more than a little bumpy at first. It’s a top-down co-op shooter, which means when it was released (originally as an arcade cabinet) it was compared constantly to Gauntlet although they don’t have a lot in common besides the camera perspective. 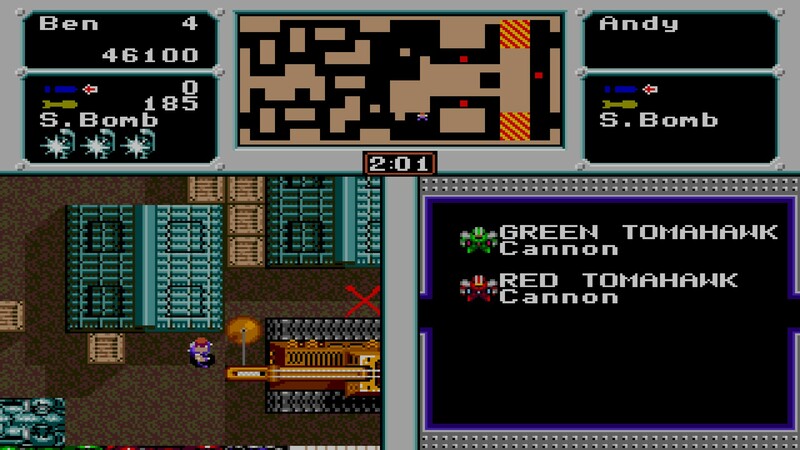 You move around the grid-like environment, and you can fire your machine-gun (light damage, hits one target) or switch to your “cannon” which shoots missiles (heavy damage, penetrates through enemies). You also have “super bombs” which kill everything on the screen. 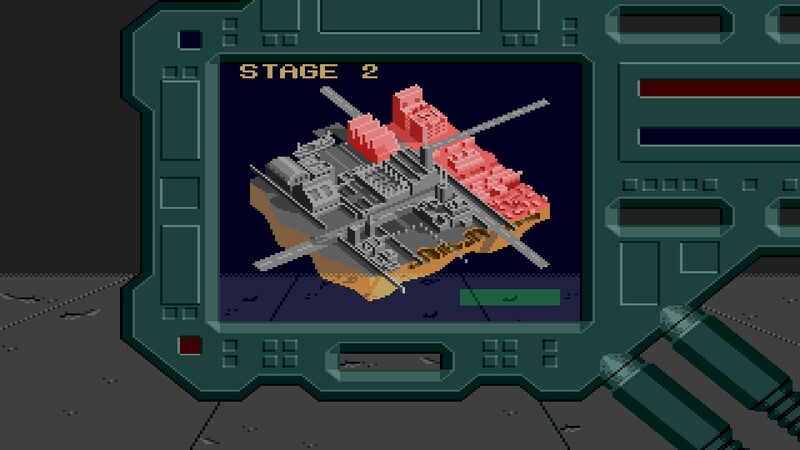 The super bombs not only kill every enemy, but even passive environmental hazards, but don’t cause any damage to the buildings or to Ben and Andy, which suggests the UN should just carpet bomb the place with super bombs instead of using these time bomb things. 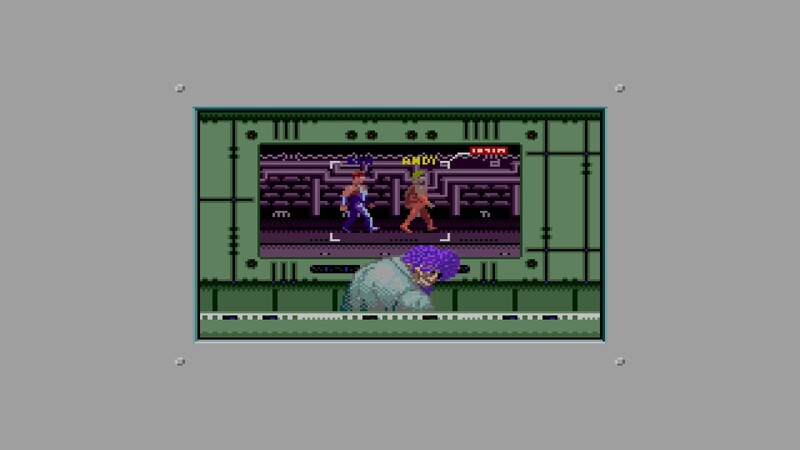 That’s it as far as the arsenal goes, although you can also punch enemies if you’re close enough, because would it be a Mega Drive title without buff dudes punching things? Haha, seriously though, it’s been three games and every single one so far has had a muscular Caucasian bro punching guys. So each map has locations where you need to put the time bombs. 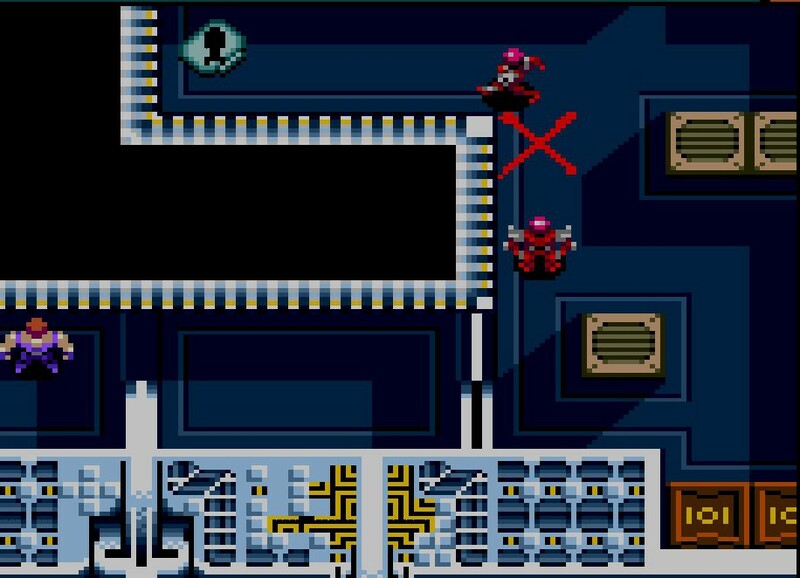 They’re the red squares on the mini-map, and they appear as red Xs on the main map. Each level gives you a limited amount of time to enter, place all the bombs, and then escape, all while the enemies try to stop you. It’s actually a really good setup mechanically, and makes sense narratively, which together leads to fun play. 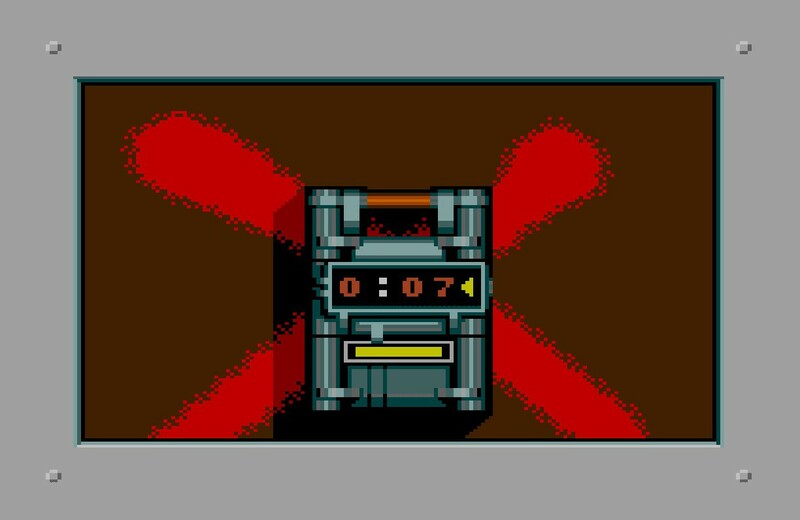 The time limit is usually somewhat generous, but it means you can’t play things too safe or you risk running out of time, so it forces you to press ahead and improvise, and it also means you need to plot a course strategically though the maze-like maps. The levels are surprisingly varied as well. There are 16 levels, spread across 4 acts. They do a convincing job making the place seem like a future industrial city (whatever that means). Some are entirely tight corridors with lots of close infighting, and others are more open where robot dogs have room to chase you. For a game about killing war-like bodies and time bombs, I expected each level to be pretty much the same, but the variety was surprising and each felt like a concise self-contained story. Ditto for the enemies. They have surprising and welcome variety. The game lets you know what you’ll be up against on a given level by listing the enemies’ appearance and name, along with their abilities. The names are frequently awesome and thought provoking, like “MAD-MURDERER” or “SHADOW-PANTHER”. The enemies can use the same machine gun and cannon as the player, but also appear with flamethrowers and lasers, or melee-only options like swords. They have pretty decent AI also, typically walking a perimeter like actual guards, and only homing on the player once they’ve seen you. Other times they do pop up out of nowhere though, which is a little cheap. Ben and Andy are pretty wimpy, and anything will kill them in one hit. But you respawn instantly, provided you have lives remaining. So its pretty difficult, but the game is relatively forgiving since it features ample extra lives and continues. That’s the only design element I think hasn’t aged well actually, and I think a health bar would be an improvement, since the one-hit system can lead to occasional annoying difficulty spikes. But the enemies themselves are fairly wimpy too, rarely requiring more than a few hits to take down. Play Summary: Crack Down is the first of these “classics” that really felt genuinely fun. Altered Beast and Comix Zone were both interesting in their own ways, but neither were quite enjoyable as play experiences in the here and now. This one though was really pretty fun. It constantly defied my expectations in rewarding ways. When the opening screen made the plot looks tremendously laughable, I was surprised by the concise editing of the interstitial cutscenes. While it first looked like a ‘run and gun’ shooter, I was surprised to find it’s actually a much more precise and deliberate game because of the fragility of both the player and the enemies. 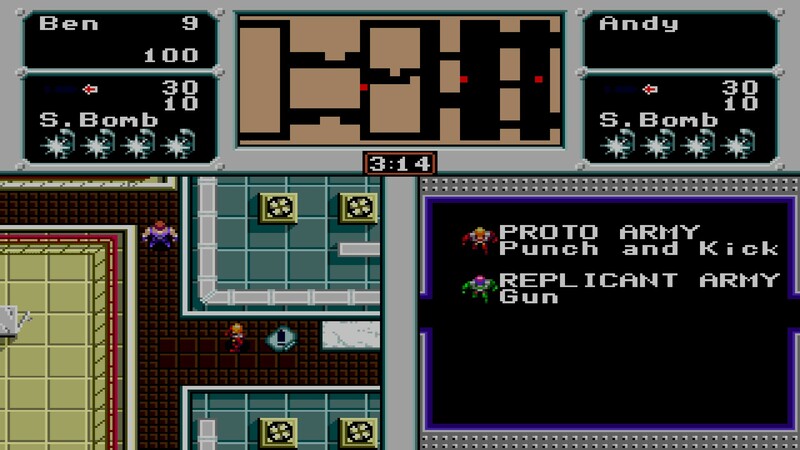 Every enemy presented novel riffs as well: First they’re mostly melee only, but then they introduce shooting ones, and then ones that can get you through walls. Or, when you’ve figured out the enemies can’t shoot diagonally while you can, you find an enemy that certainly can shoot back at you diagonally. The design isn’t perfect by any means, but it does such a great job introducing you to gameplay mechanics, and then shifting those expectations as you master them. My favorite moment was learning you can press yourself up against walls. At first I couldn’t find an obvious use for this, because it makes you slower and you can’t fire around corners as if behind cover. But I discovered its purpose, which is is that it makes you invincible to shoots fired along the wall axis you’re pressed up against. This is well balanced design already, because while wall-sliding makes you invulnerable in two directions, you’re defenseless in a third, you can’t shoot, and you move at half speed. But the masterstroke is that the enemies are affected by friendly fire. The sense of accomplishment and discovery when you first hug a wall and watch two enemies kill themselves in the crossfire is glorious. The game never tells you to do this, it just has an elegant system that permits such enjoyable discoveries. The level design presents many little learning opportunities as well. At first the levels have no doors and you just bumble around. Then sliding doors are introduced, which block line of sight until you enter them. Still later you find doors that swing open, which block fire and movement until they’ve been closed behind you. All throughout, what could’ve been a very simplistic shooter is instead lovingly complex in the particulars. And Crack Down really shines in these intelligent little details. It more than makes up for the game’s only glaring problem, which is that its really quite short (though unsurprising given its arcade origins). Whereas Comix Zone compensated for its short length with horrible unfairness and difficulty, Crack Down is content to just be a fun and well designed experience, encouraging you to come back for more. Haha, oh man, I just got it. They’re timed bombs, like on a timer. I kept thinking of a “time bomb” as something that like, exploded time itself. It just means a bomb with a timer though. Ughhh. It’s so obvious in retrospect. Oh, Crack Down. Observations and Takeaways: The main thing to note about Crack Down is the excellent design work in the details I mentioned above. Games too often feel like they’ve been designed at the macro level, like taking a big concept and going at it from there (ie, “it’s a beat-em-up, but you can turn into a beast!”). This though has a pretty unassuming, almost generic, design premise (top down shooter), and instead focuses on micro aspects of the design to really perfect that core experience. That’s an admirable lesson. The other thing I’d note is that the game is also a masterclass in narrative conciseness with its cutscenes. Each one is maybe two or three shots, each only a second or two long, that act as plot advancements and establishing shots for the environment. I was really impressed by their efficient and elegant conveyance of story, and they’ve aged remarkably well. Phew! 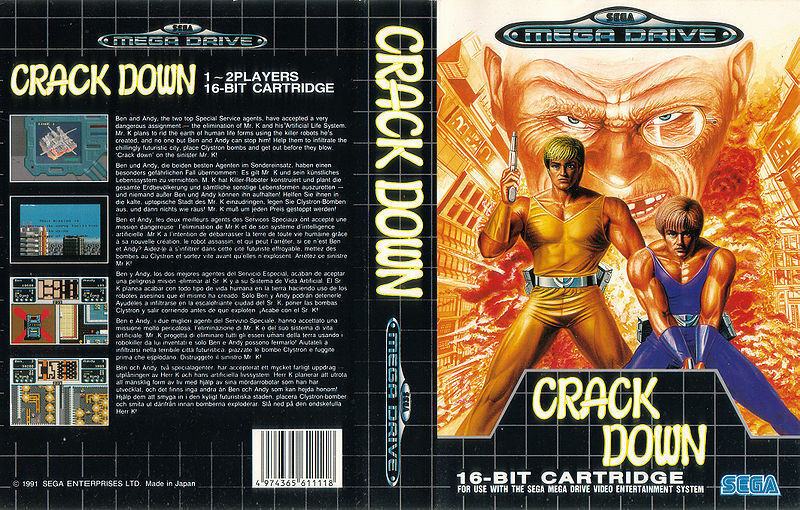 Playing Crack Down convinced me that this “play some old games” thing might actually be a worthwhile experience! Next Time: Speaking of good games, next up will be Ecco The Dolphin, a beloved classic about singing cetaceans saving Earth from hostile aliens.